Continuity mistake: 4-11: Truth or Cosmoquences / Beach Bummed: When we first see Trixie and Timmy inside Timmy's large sand castle (or whatever it was), they were sitting at the ends of a long table. But when Francis destroys the castle, Trixie and Timmy are way closer together. Factual error: Each time Timmy jumps through time, he goes back 10 years from 2002 (1992, 1982, 1972). However, some of the 80's references, such as Miami Vice, Flashdance & Back To the Future all came out after 1982. Continuity mistake: In an earlier episode, we see that Timmy's dad looks exactly like him as a child, but in this episode, they look completely different. Continuity mistake: When Wanda is in Level 14 Probation, Mama Cosma writes "Level 14 Probation" (in capitals and lowercase letters) on the board, but when Wanda yells "NO..", the board reads "LEVEL 14 PROBATION" in capitals. Factual error: In Deja Vu, after Vicky steals Timmy's Cosmo watch, she redoes the time to when it was after school. Vicky redoes the time so that a million cats appear to torture Timmy. They throw him out a window which really has solid glass and no sliding doors. He should have been hit onto the window. Deliberate mistake: When AJ and Chester show Timmy "The Timmy Tuck", AJ says it has a 1400 degree turn. The diagram shows 140°. Continuity mistake: In 'The Grass...,' when Timmy is juggling a bear, the bear wrestler, and the lead carny, there is a close-up of the lead carny as he flies past the camera over and over, yet you never see the bear or the bear wrestler fly past the camera. Continuity mistake: Episode 66-5 "Hassle In The Castle/Remy Rides Again": In the final scene, notice the house across the street furthest to the left; first time it is shown there is a large window with light coming through. The last time we see the same shot, however, it is a totally different house. 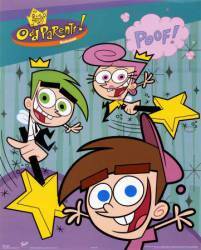 Other mistake: When Jorgen does wand-ups to Cosmo and Wanda, he counts 1,2,1,2,etc, yet when he does them to Timmy, he counts 1,2,3,etc. Continuity mistake: In the scene when the Sleep Fairy shrinks while talking to Timmy, he measures himself. The ruler says three inches. Then he shrinks down to two inches. The camera cuts to Timmy. Then it cuts back to the Sleep Fairy, who quickly discards the ruler. If you are fast enough, you'll notice that the ruler says he is three inches again. Plot hole: In Kung Timmy, technically Timmy should still have kung fu powers during the fight with Francis, because he's fighting to protect Cosmo and Wanda. Continuity mistake: Beddy Bye- In an early scene, Timmy's parents are watching "Up Late in Dimmsdale." In a later scene, when Timmy is featured on the show after they've run out of guests, the sign behind him is "Late Night in Dimmsdale" instead of "Up Late in Dimmsdale" like it was before. Continuity mistake: In Most Wanted Wish, the teleporter to Texas has 3 red dots on the top right and left. When Timmy makes it to Texas, the ones on the top right disappear. Plot hole: Season 6, Episode 5 (overall episode 73) "The Good Ol' Days / Future Lost": In the episode "Future Lost", when Mark is hugged by several students at school, wouldn't he possibly freak out, since he is a Yugopotamian who doesn't like being hugged? Factual error: When Dad gives Timmy an "I Made My Dad Richer" badge made out of a Sheriff badge, the word "Sheriff" is at the top. Shouldn't it be at the middle of the badge? Continuity mistake: Episode 4-6 "The Jimmy Timmy Power Hour": In the scene where Timmy and Cindy are in the Candy Bar their milkshake has two straws for the first two shots. But in the next shot there's only one straw which is on Timmy's side, it then moves to Cindy's side. Then when Carl, Sheen, and Libby run in both straws appear again. When they all run out there's only one straw and on Timmy's side.